REGION — Grapes are a juicy treat, whether as a snack or after fermentation turns the fruit into wine. 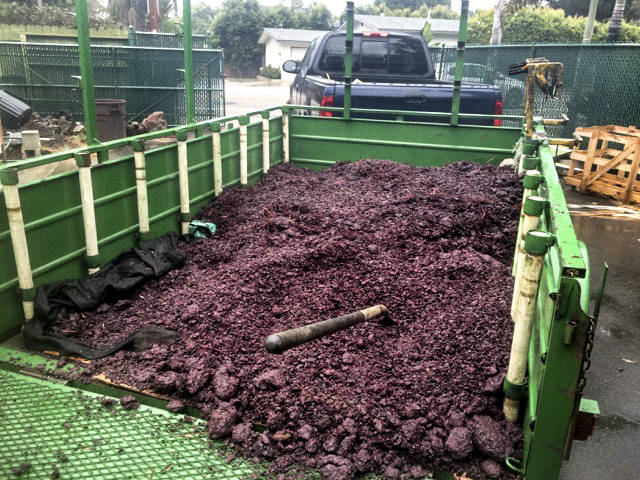 But urban wineries have a challenge, disposing of the skins after the grapes are pressed. But for Carruth Cellars Winery, owner Adam Carruth went a more eco-friendly route in partnering with BioEve and recycling the skins. Dave Johnson of Cardiff founded BioEve in 2016 and has seen his business grow with some pace as he provides an organic option for composting and soil. Johnson and Carruth met three years and formed a business relationship and friendship. Johnson, meanwhile, has expanding his operation to a larger private farm to handle a growing customer base. He also owns chickens, from which he harvests the manure to then sell as fertilizer, while also using the manure in his compost heaps, which are also mixed with hay. However, due to a lack of precipitation over the past year, most of his piles have not decomposed as quickly. With water, the natural composition of the hay and fermented grapes rapidly breaks down, and adding mulch creates a natural fertilizer. But with the recent rains, the process will get back on track, although much of his product won’t be ready until mid-spring and early summer. Carruth, meanwhile, began his career in his backyard in 2001. By 2006 and after a stint learning the business in Sonoma County, he was producing 30 barrels per year and in 2010 opened his first location in Solana Beach, where production is done. He has since added two other locations in Carlsbad and Little Italy in San Diego. Last year, he said, the Solana Beach winery processed 200 tons of grapes, with 80 tons going to BioEve. Carruth began his partnership with Johnson in 2016 and each year Johnson has taken on more including 200 cubic yards last year. He also hired Johnson to build out the wine garden in Little Italy, in addition to his normal routine of gathering spent grapes about every 10 days, which is how often Carruth presses grapes. Johnson, though, has been able to expand quite quickly over the past three years. He went from composting and using hand-labor to now loading waste with a large dump trailer to accommodate his growing stock.